Good value for money tidy and well-kept holiday cottage. Private rear courtyard with secluded outdoor dining area. This cottage is approx. 100 metres from the main street and the centre of the village of Akaroa and is well suited to those wanting to explore the beautiful Bank Peninsula region. There’s a good children’s playground if travelling with children, beaches for playing in and a pleasant drive by car to the outer bays of the Peninsula will find some of the best unspoilt beaches in Canterbury. Banks Peninsula even has a couple of hidden surfing spots which are world renown. The village also boasts a decent sized supermarket, many cafes, and a host of wonderful restaurants. The safe bay also offer great walks and hikes, along with boutique shopping, galleries, wineries and the famous Barry Point cheese factory. Akaroa is 1,5 hours from Christchurch city, and has a regular mini-bus service operating between Christchurch City, and both the International and Domestic airports if you’re arriving from another city. This Property has no off street parking. Very cute cottage to stay at, full of historical charm in the heart of Akaroa. Perfect place to stay to immerse in historical charm. The house is well equipped, and the bedroom layout suited our famimy group well. Lovely back yard with a table for morning coffee felt very private surrounded by garden. Close to shops and restaurants. We thoroughly enjoyed our stay at the Historic cottage. A cottage with a lot of character. Very charming. Very close to the beach. Awesome location for a in town Akaroa stay, but can be a bit noisy at times. Very cute old cottage hidden behind bushes. Needs airing out a bit, beds are comfortable and kids loved not having to share a bed. Kitchen is small and you wouldn't want to cook big meals in it. Overall it was perfect for our Akaroa weekend. Lovely Victorian cottage, ideal location and full of character. We enjoyed our brief stay in this lovely old cottage. 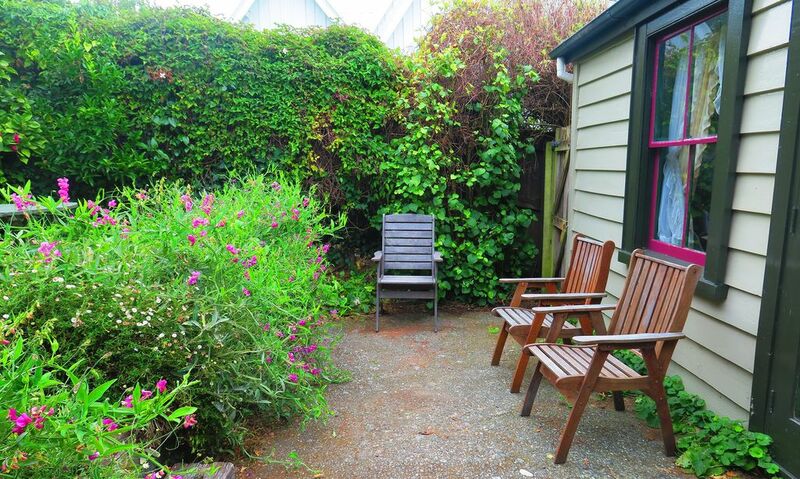 Comfortable with a beautiful little cottage garden out the back, just right for a quiet sundowner. Ideal location. Thanks very much for the lovely review. Location is good but parking is a problem to get as street full till after 6pm. The house is functional but very dated. 90% of the windows dont open so very hot and stuffy and house has a very strong damp smell which is quite over powering even after burning lots of incence. Double bed in main bedroom is small and hard. Singles bed ok. Great private court yard out the back would benefit a bbq. Very noisy street from around 5am with cars and boats looking for early parking. Wouldnt stay again ! Great wee place, fantastic location.